Customer feedback. Review Page 11. PROS: Вече няколко пъти ползвам услугата "наем на автомобил" както за мен, така и за мои близки и приятели от Германия. Много съм доволна от акуратното и любезно обслужване, както и от предоставяните коли. PROS: Highly recommendable. We have used the services of Motoroads several times; Motoroads are always on time, the cars are clean and fully functional. We even had an accident, debree from the roof top falling onto the car during a thunder storm, breaking the front screen and other damage, but motoroads immediately provided us with a substitute - very good value for the money. I can only recommend Motoroads. PROS: Have used Motoroads for years. Great service, good cars and value for money, Friendly staff. Met on time and drop off was easy. PROS: Great service, easy to book, can select currency to pay in, which is great. Pick up and drop off was very smooth and the drivers were polite and could understand basic English. We have used these guys for many years and will continue to do so. PROS: Ние ползвахме услугите на Мотороудс миналата година и сме много доволни. Хората ни чакаха на летиштето. Колата беше в перфектно състояние. Никакви проблеми по време на престоя ни. 24/7 връзка с някой от екипа. Препоръчваме Мотороудс на всеки който има нужда от кола под наем. И не на последно място цените- Няма такива цени!!! PROS: Thank you for the perfect rental car service. I will use you service next time again! All the best and till next time. PROS: Thank you very much Motoroad for the excellent service. Everything was perfect, very nice car and also very kind lady who attended me. I will use Motoroads' services in future for sure. PROS: Always good service, at terminal ready to meet us, swiftly to the car. PROS: Thank you for excellent services. All agreements have been meet. We suppose use your services next year In Spain or Italy. PROS: Service was very good. Driver was always waiting in time . No problems at all. Will recomend to all my friends who might need similar service during their visit in Bulgaria. PROS: Very professional service and friendly service. Would use Motoroads again in the future. CONS: Having to Pay the Return fee in advance made me a bit nervous, but the driver was ready and waiting for us at the agreed time with a smile on his face. PROS: I have used Motoroads many times, and each time have been impressed with their service. The staff are always on time to meet you at the airport, are friendly and helpful,,even to to the point of helping with directions. The vehicles are always valeted, are are clean and fresh. On returning to the airport the driver was there to meet us on time. We will be using Motoroads again, as their prices our competitive and all in all they offer a very realiable service. PROS: I had a BMW GS700 for three days end of January at the Algarve coast - everything was perfect! Thank you, I would always rent again! PROS: I am using Motoroads for a second time for my travel to Macedonia. It was a pleasant trip, fast and with no problems. The car was on time both times and the driver was helpful. CONS: It wold be really helpful if you could put some signs on the cars or send in advance the number and the model of the car, so it ill be easier to recognise the vehicle when meeting for the first time. PROS: c 19 по 26 февраля 2016г. брали в прокат renault megane. Всё понравилось , машина была в хорошем состоянии и экономичная, всё супур компании спасибо! PROS: This is the second time that I have used Motoroads and couldn't have been more pleased with the service that they provided. Before I used Motoroads I used two other companies which both let me down and arrived late with and had unfriendly drivers. I have used Motoroads now for a transfer from Skopje to Borovets, from Sofia to Borovets and from Borovets to Sofia and on all three occasions the drivers have been on time or early, the vehicles have been clean and the drivers have been polite and friendly. I will only use Motoroads from now on they are the best! PROS: We have used Motoroads many times for our transfers between Sofia Airport and Bankso. The car or minibus is always on time, the drivers are always very pleasant and helpful and the journey has always been completed without a hitch. We have pleasure in seeing the same driver as we have struck up a lovely relationship with him. CONS: It would be helpful if the amount of the deposit paid online was printed on the Transfer Voucher. At the moment only the amount still due is mentioned. When splitting the cost between several people the whole cost needs to be known. PROS: Good service, Competative prices. Will come again. PROS: Car ridders realy fine! The agent which bring the car and also pick it up was on time. PROS: I have used Motoroads a few times now. Easy to book and good value. they are always waiting for you on both arrival and drop off. The cars cars are in good condition and relatively new. collect car with full tank of fuel and drop off with full tank, avoiding paying for fuel you do not use. CONS: small charge for out of hours collection/dropoff. PROS: It was the second time we travel with motoroads. Really good company, always on time and with the best prices in the market. The drivers are very polite and helpful. 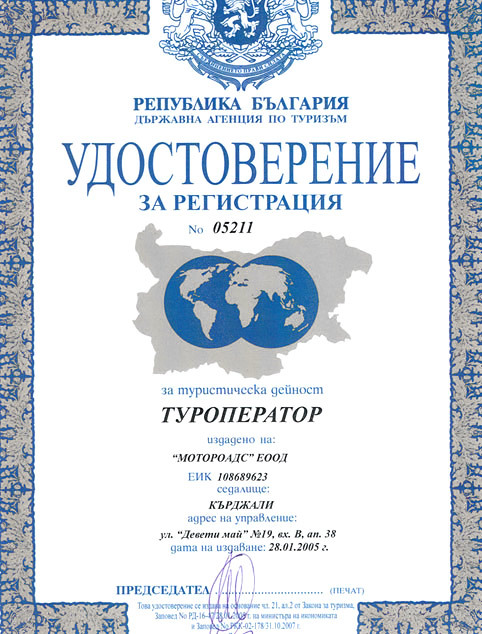 PROS: We used Moto Roads transfer two years ago from our home is Sofia to Velingrad. Since we were 4 adults with a lot of luggage we ordered a van. Everything was so easy to arrange - quick reservation process and amazing service. We are definitely planning to use them again this year for our visit. We use transfers and car rentals almost every week in Boston where we live and I must say you a doing a great job! Thank you Moto Roads! PROS: Второй год подряд оформлял в аренду Тойота Камри 2.4i на две недели в конце июня (2015 год) с выездом в Грецию. Вместо выбранной машины предоставили дизельный Ford Mondeo последней модификации. Машина в отличном техническом состоянии, вся семья поместилась с комфортом. Вся семья осталась очень довольна! По времени подачи в аэропорту София всё точно: оформляли на стойке, всё быстро и удобно. Сдавали тоже в аэропорту: так же никаких нареканий. В этом году обязательно буду арендовать машину у Вас. PROS: Fantastic service, the taxis always arrived on time and got us safely to our next destination. PROS: Арендовали машину в январе 2015 в Пловдиве. Бесплатные детские кресла, дружелюбные сотрудники. Отличные цены! остались очень довольны. PROS: Информацию о компании (аренда авто) получили из интернета. Через интернет забронированили подходящий нам автомобиль на весь срок отдыха в Болгарии. По прилету в аэропорт Софии нас втретил представитель копмании, с ним мы оперативно оформили документы на аренду авто, что нам понравилось.В конце от дыха так же в аэропорту сдали автомобиль. Такие условия нас устроили и в дальнейшем мы готовы пользоваться услугами вашей компании. PROS: We have used Motoroads for many years and found them to be great value for money and a friendly and reliable service. The vehicles are always clean and have the right level of equipment for the conditions, especially Winter where winter tyres and snow chains are provided. We have taken their cars across the country without a hitch. CONS: Some of the cars have high mileage and interiors can be a little worn, but acceptable for the costs. PROS: Very user-friendly service.I used the car for rental a few times. Always received attentive and professional service. good combination of price and quality. And I hope for further cooperation. PROS: My rental was wonderful,I was met at the airport by a friendly man who took me to my car. I signed all papers and off we went. Car was very economical on petrol and we traveled around Bulgaria alot,car was reliable,no problems. Service was great,I will use Motoroads again on my future travels. Thank you,Michael Palmer. CONS: GPS was programmed to only give directions in in Bulgarian,we tried to change it to English but English voice was not loaded. PROS: Доволни сме от услугите.Корекност и точност. PROS: Very good and professional service. Easy to make the reservation, payment and pick-up, no hidden charges or ``rules``. PROS: I have used Moto Roads 3 times, 1 transfer and 2 car rentals. The service has always been 1st class, good prices with friendly staff. I was recently delayed 10hrs by the airline, but Moto Roads were still on time when I eventually landed in Sofia. I would not use any other company. PROS: Very happy with the service. My driver was polite and ensured that I reached my destination within time. I would gladly use this service again. PROS: Excellent price/quality ratio. Very satisfied. PROS: This was the first time that I had used an off airport car rental company and I was pleasantly surprised by the efficient and friendly service. CONS: On my return, I missed the car hire phone calls as I was checking in at the airport but eventually picked up the call when I moved to a quieter area and the return process was easy after that. PROS: We always recommend Motoroads for both transfers and hire cars for any of the visitors to our ski apartment in Pamporovo. In all cases, the level of service has been very high and all of the feedback has been positive. We have more visitors this season using Motoroads and I am sure they will continue to exceed all their expectations. Keep up the good work Motoroads! PROS: Very friendly and friendly web site with complete service information and transparent pricing. I'm using it to book for my ATV and vacation rentals. PROS: We always use Motoroads for car hire when we stay in Pamporovo. Nice people and very reliable - whatever time of year.